Springlike temperatures and a few dry days have drawn me outside and away from all things electronic. I haven't felt this good since last spring. Love this time of year, seeing the Earth wake up again. Mostly I've been raking. Since we had a drought last summer, there is a lot of debris out there. I've been doing one day outside and the next inside. Since I didn't do much exercising last winter have to build up stamina. 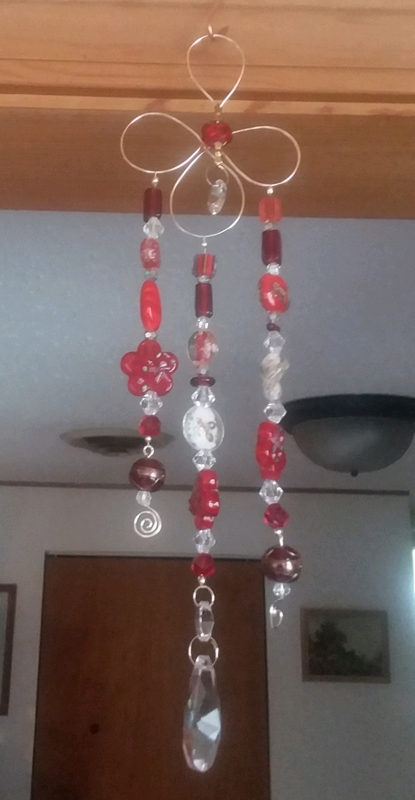 Made a couple more sun catchers. Erin's is blue and she has taken it home. Tracy took the rainbow one and somewhere around here is hanging a red one. Need components if I'm going to make more. Have been avoiding working on the bathroom mosaic. Though I'd like to get it done, the last little bit played havoc with body. The raking has been a tonic for me. I actually liked the way it felt to move my body. In honor of this new feeling in the old bod, the husband and I went shopping for walking shoes. There is a single shoe store in the nearby town, but they have Skeechers, Merrills, Bjorn.. some reasonably comfortable shoes. And, actually I prefer less choices. I haven't used the walking shoes yet. Uninviting outside today and fits of precip, and yesterday was raking. Maybe tomorrow? I also bought a "cute" pair of shoes. 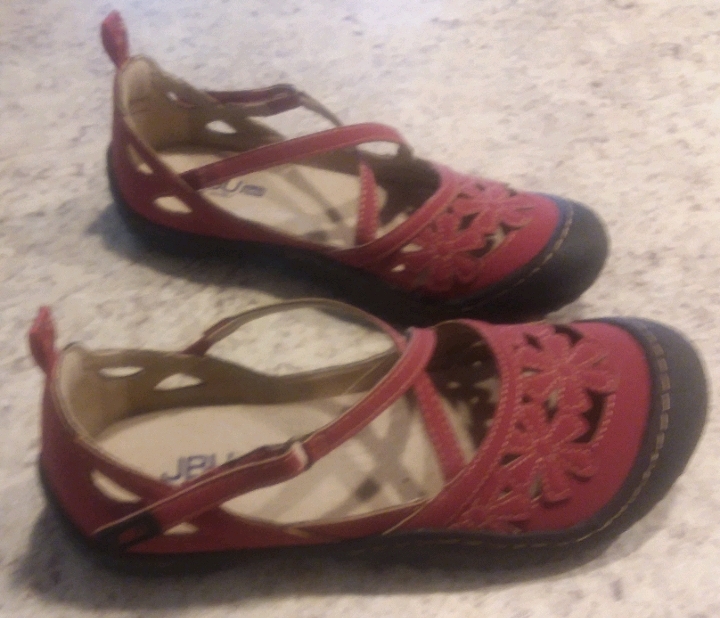 Having long been a fan of red shoes I found these on sale for 1/2 price. Already worn them. I can be a real fool for some shoes. Went to see Anah inducted in the National Honor Society. The kid is always getting awards these days. The first in a long line of really smart introverted females to have some confidence. I appreciate that about her. 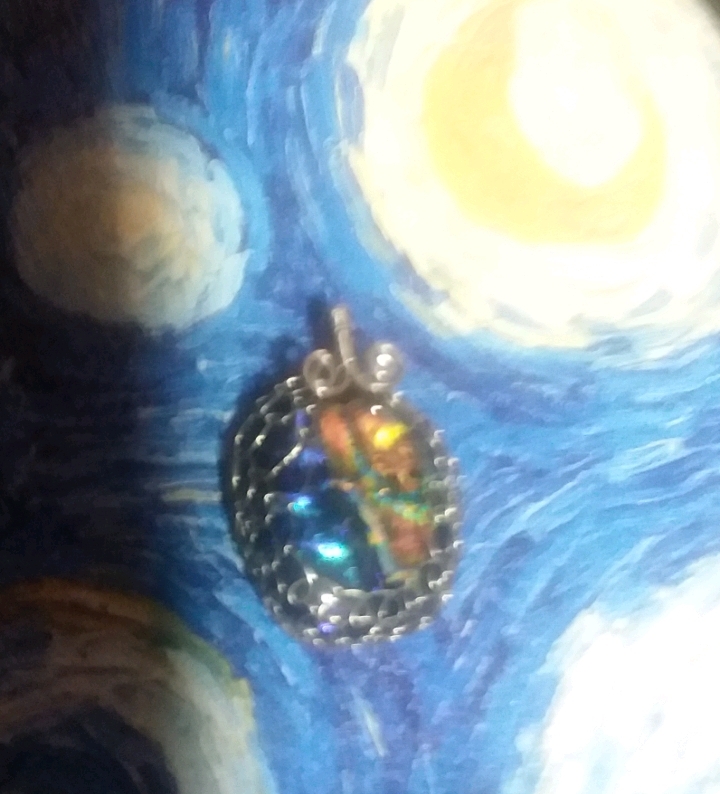 I finished a pendant that had been lying on my jewelry board for 2 years. Have a necklace to repair for my ex son-in-law. He's a good man. Repaired a purse for daughter no. 2. I tell ya, these people are going to be lost without me when I die...none of them can sew. At least they all cook. On Sunday just past, grandchildren prepared most of Sunday dinner. Grilled wings and brats, marinated potato salad, baked beans (the husband made those) and Anah whipped up a beautiful fruit pizza for dessert. And, they cleaned up the mess! I totally love it! They come to my house and cook me a meal and then clean, these must truly be the "golden years." Continue to exchange daily emails about that for which I am grateful. Amazing results from that really. Noticeable positive shifts in relationships for sure. Happy to be doing this again, it raises my vibration and it often needs that. Booking tickets to see Ziggy Marley in Denver. This is going to break the curse of "crap vacations." Concert being held in the Denver Botanical Gardens. Denver being only a mile high, we should be good with the altitude and we have a credit from last year's aborted trip for airfare. I'm excited already. The alarm for my eye drops just went off so I'll take that as an omen to stop writing and put them in. I hope Spring is blowing your way. 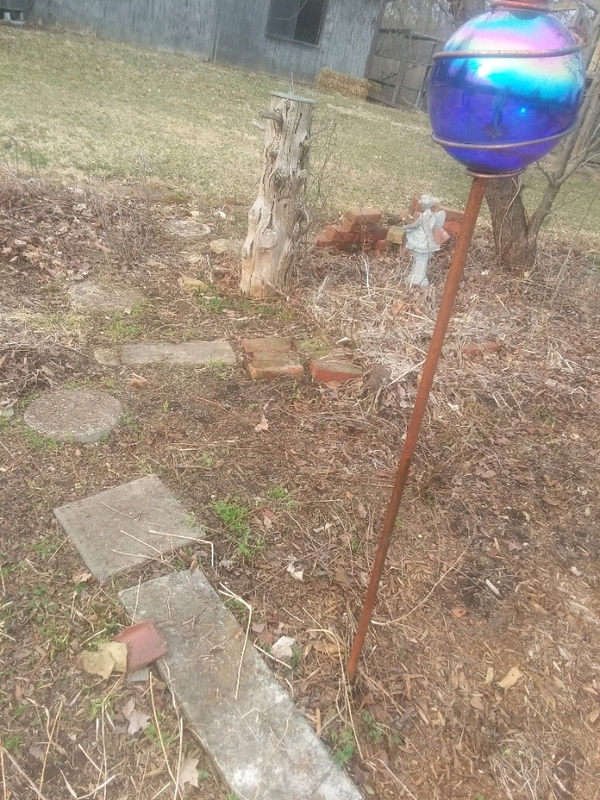 Spring is coming our way and I have the weeds to prove it. Not to mention the allergies. But, I'm still happy it's here. I like the sun catchers. Are those Skechers? Those are cute. 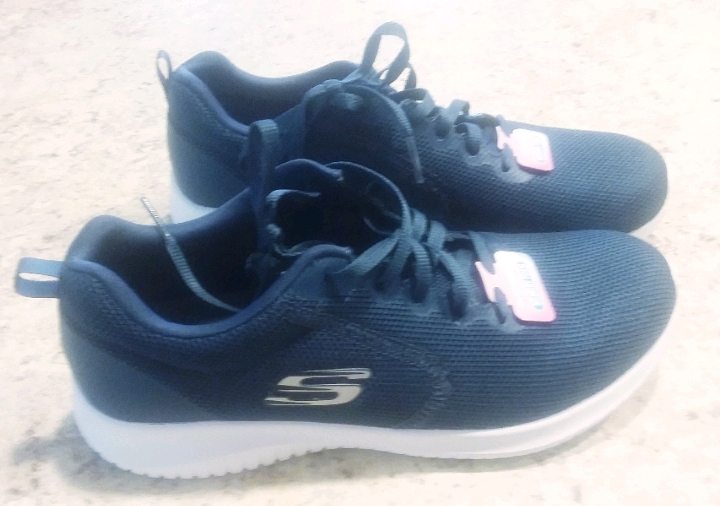 I like Skechers because, a least, the ones I have bought are really light weight. Sunday dinner sounds wonderful. Especially because all you had to do was eat. And you could do it right there at home. Excellent. The drought killed off a lot of weeds, so my gardens feel more doable this season. Totally awesome to get a good meal eith no effort! Those are some seriously cute red shoes! Must be nice to be able to get out and do some yard work. I'm looking forward to spring coming our way too. Maybe in a few more weeks. The first in a long line of really smart introverted females to have some confidence. Nice! I always felt like Chloe was a better version of me - she got some good things from me and then improved upon them even more. I am a sucker for red shoes, reminds me of the David Bowie song. It feels good, doesn't it; to see improvement in the line? I love Skechers - so comfy. Big turn around for the moment. I shall revel in it while it lasts. Ohh sweetheart I just love these sun catchers you're making ^_^ Rainbow is a no-brainer, but have you made a purple one? Pics if you do, plz!! The red is lovely. I always keep a red thing in our bedroom (Feng Shui ba-bay!) and right now it's a beautiful transparent vase! It needs some fresh white flowers in it. The pendant is incredible <3 Good for you for finishing it up after so long ^_^ That always feels so great. I have a mental image now of you raking with a little smile tugging at your lips--hope you enjoy the beautiful sunshine today! Haven't done purple yet, but it could happen. I knew Anah was destined for great things from her beginning. Thanks on pics, easier than writing. That's funny that you should say that. Not sure I could construct a garment, though once I even made prom dresses. Love the sun catcher and the shoes. Red is my favorite colour! Isn't it amazing what a couple of days of decent weather can do? I'm so glad for you that your long winter has ended. Great that you have one of those shoe shops. I am a sucker for those sort of red shoes, too. And yay for Sunday dinners! Sounds like spring has been good to you so far. Love the red shoes! Loving spring! The shoes have been fun.